Phineas Taylor Barnum (July 5, 1810-April 7, 1891), known as P. T. Barnum, a prominent Universalist, the most influential American showman of the nineteenth century, was the founder of the first financially successful museum in America to gain wide public support and creator of the modern three-ring circus. Phineas was born on July 5, 1810 in the small Connecticut community of Bethel to Irena Taylor and Philo F. Barnum. As a child he attended the only church in Bethel, the Congregational. As he attended prayer meetings and discovered Calvinistic ideas, indeed almost feeling "the burning waves," smelling "the sulphurous fumes," and hearing "the shrieks and groans" of those in hell, he realized it was not the faith for him. Fortunately for him his Universalist grandfather acquainted him with belief in a loving Deity and the universal salvation of humanity. 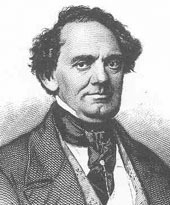 Young Barnum addressed Universalist gatherings and for some years served as clerk of the Universalist Church in Danbury, Connecticut. Barnum's first job was clerking in his father's country store. As a young man in the 1820s and the 1830s he worked as a clerk in Brooklyn, ran a fruit and confectionary store back home, and was a lottery agent in Pennsylvania. In 1829 he married Charity Hallett. In time they had four children. Between 1831 and 1834 Barnum edited his own newspaper in Danbury, the Herald of Freedom. He started the paper to combat what he perceived to be sectarian attempts to bring about a union of church and state. Three times charged with libel for statements he made about opponents, he was once convicted and was incarcerated for 60 days. He spent his time in jail comfortably. "I had my room papered and carpeted previously to taking possession," he wrote. He had a constant stream of visitors including a pastoral visit from a local Universalist minister. His release was a public relations event. 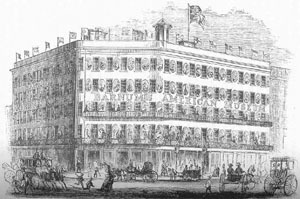 In 1835 Barnum was once again in New York City, running a grocery store and a boarding house. There he first got into show business with his exhibit of Joice Heth, who cl aimed to be the 161-year-old nurse to George Washington. Next, during 1836-37, he took a small circus on a tour throughout the South. These ventures prepared him in 1842 to open the American Museum in New York City, through which he made his first fortune. Its many exhibits and spectaculars, and its lecture hall and 3,000-seat theater, provided entertainment and learning over the years to 37 million people. During the early 1840s when Barnum lived in New York City he attended the Fourth Universalist Society. Its minister, the well-known and popular preacher Edwin H. Chapin became his close friend. While not a member of the society, Barnum was on its Sunday school committee and when the congregation built its present edifice he was a generous contributor. He was also a life member of its Chapin Home for the Aged and Infirm. In 1848 Barnum moved to Bridgeport, Connecticut where he was to live until his death. Almost immediately he became connected with its Universalist society. As A. H. Saxon points out in his biography of the showman he soon was "on intimate terms with the several ministers who served the society during this period, 'talking Universalism' with them at every opportunity; entertaining them, and occasionally the entire congregation, at the clambakes he loved to throw at the beach on Long Island Sound; running into the parsonage whenever he happened to be passing to speak a few words of greeting and drop off a thanksgiving turkey or some other gift." He also had the habit of sending flowers from the greenhouse of his mansion Iranistan for Sunday worship services. During the last ten years of his life he was a church trustee and from time to time occupied the pulpit. Barnum faithfully supported the society's financial needs. Not only did he give money on a monthly basis, he also gave handsome gifts toward the rebuilding of the church after a fire and to constructing a parsonage. He helped to make possible a new furnace, stained glass windows, and an organ. Charlotte Coté relates that during Olympia Brown's ministry at Bridgeport: "It was said of her that when the church was in need of additional money, she was not above asking that the rich be more generous in their contributions, and she would say, 'Mr. Barnum, I mean you.' According to the report, Mr. Barnum never failed to oblige her." Barnum had among his friends many Universalist and Unitarian ministers and laypersons. These included not only those who ministered at his home church in Bridgeport but such figures as Quillen Hamilton Shinn, the denomination's popular itinerant missionary to the southern American states, who Barnum jokingly called his only rival as a showman. Others he was especially fond of were Abel C. Thomas, George H. Emerson, Mary A. Livermore, Robert Collyer, Horace Greeley, and Charles A. Skinner. In 1850 Barnum brought the "Swedish Nightingale," Jenny Lind, to America. She gave over 90 concerts under his management. Four years later he published the first edition of his popular autobiography, The Life of P. T. Barnum, Written by Himself. In 1855, because some of his investments failed, he was forced to sell his American Museum to pay off debts. Five years later, however, he brought it back. The museum burned down in 1865. He had it rebuilt on a nearby site. By 1870 Barnum was preparing a traveling show that featured a menagerie, caravan, hippodrome, and circus. Its first performance was in Brooklyn before 10,000 people. This evolved into his first two-ring circus, the "Great Traveling World's Fair." A decade later this had become the Barnum and Bailey Circus, "The Greatest Show on Earth," with its remarkable star the great elephant Jumbo. In 1864 in an interview with a New York Sun reporter Barnum said this of his religious faith: "I believe there is a great Creator, infinite in his attributes of wisdom, power, and mercy: that His name is Love. I believe He is a God of all justice, and that He will chasten every person whom He ever created sufficiently to reform him, in this world, or some other." About twelve months before his death Barnum wrote out his religious beliefs. Entitled "Why I Am a Universalist" it was first published in London in theChristian World of May 8, 1890. Several Universalist journals soon printed it and many Universalist ministers shared it with their congregations. It was issued as a pamphlet by the Universalist Publishing House and within the year 60,000 copies had been circulated. It was the first Universalist tract that the denomination's missionaries in Japan translated into that language. Charity had died in 1873 and Barnum had married Nancy Fish the following year. He died at the height of his popularity as a showman in 1891. At his death Barnum left the Bridgeport Universalist society a legacy of $15,000. He was just as generous a supporter of causes endorsed by the national Universalist movement. He gave its newly founded institution of higher education, Tufts College, $50,000 to establish a Museum of Natural History; and later he gave Tufts another $100,000 to build two wings to the museum. In addition he sent the museum mounted skins, skeletons and other animal remains, and the great elephant Jumbo's hide. He did not neglect other Universalist educational projects either such as St. Lawrence University and Lombard College. When he died his will stipulated $7,000 for the Universalist Publishing House, $5,000 for the Connecticut Universalist Convention, $1,000 for the Chapin Home, and $500 for the Woman's Centenary Association. In his business ethics Barnum was more honest then most people have been in the entertainment and public relations fields. He offered his customers good value, which is why they returned again and again to his various productions. Indeed, he considered himself a public benefactor. Most Americans, he thought, worked too much and as a consequence did not know how to spend their leisure time. "[Americans'] inclination to intemperance and kindred vices," he wrote, "has repeatedly and most conclusively been shown to be a natural result of the lamentable deficiency among us of innocent and rational amusements." In providing the philosophical basis for his entertainment business, Barnum cited Unitarian minister William Ellery Channing's essay, "On the Elevation of the Laboring Portion of the Community." As for the cynical quotation associated with his name, "There's a sucker born every minute," he never uttered it. Indeed, he respected the public and kept his many attractions for them, as he said, "clean, moral, instructive, elevating." And while he frankly admitted that "my prime object has been to put money in my purse," he also proudly asserted that "No one . . . can say that he ever paid for admission to one of my exhibitions more than his admission was worth to him." In 1889 Barnum summarized in a notebook his principles of life: "The noblest art is that of making others happy, honesty, sobriety, industry, economy, education, good habits, perseverance, cheerfulness, love to God and good will toward men. These are the preeminent requisites for securing Health, Independence, or a Happy Life, the respect of Mankind and the special favor of our Father in Heaven." The main archive of Barnum materials is at the Bridgeport Public Library. Later editions of Barnum's autobiography are Struggles and Triumphs; or, Forty Years' Recollections of P. T. Barnum (1869) and Struggles and Triumphs; or, Sixty Years' Recollections of P. T. Barnum (1889). Selected Letters of P. T. Barnum (1983) is edited by A. H. Saxon. 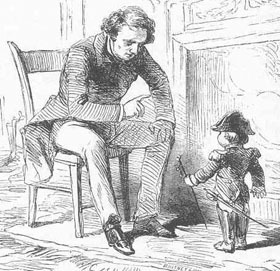 Barnum also wrote The Humbugs of the World (1865). A selection from the text of Why I Am a Universalist is available in Ernest Cassara'sUniversalism in America (1971). Some recent biographies of Barnum include Irving Wallace, The Fabulous Showman; The Life and Times of P. T. Barnum (1959) and Neil Harris, Humbug: The Art of P. T. Barnum (1973). The best, most thoughtful biography, however, and the only one to consider the place of Universalism in his life, is A. H. Saxon's P. T. Barnum The Legend and the Man (1989). Saxon also wrote "P. T. Barnum: Universalism's Surprising 'Prince of Humbugs,'" The World, 2 (1988). On Barnum and Olympia Brown see also Saxon, "Olympia Brown in Bridgeport: 'Acts of Injustice' or a Failed Ministry?" Proceedings of the Unitarian Universalist Historical Society (1987-88) and Charlotte Coté, Olympia Brown, The Battle for Equality (1988).